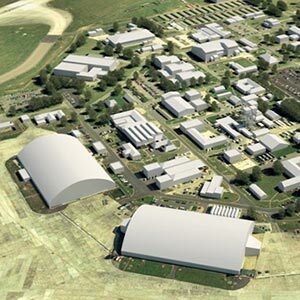 Balfour Beatty and Kier Construction have won a £121 million contract to construct a new Defence College of Technical Training on the former RAF Lyneham airbase in Wiltshire. Work will start on site early in 2014 for completion in autumn 2015 and around 900 jobs will be created at construction peak on a project that was originally estimated as being likely to be let for between £180 million to £230 million by the Defence Infrastructure Organisation when it went to tender last year. The 50:50 joint venture for the Ministry of Defence, called Project Hercules, will provide new single-living accommodation for military trainees with purpose built enhanced training facilities including a large outdoor training area. A museum for the Army Corps of Royal Electrical and Mechanical Engineers (REME), which will be headquartered at the site from 2015, will also be built as part of 53,000 sq m of new buildings. Hercules will provide training facilities in a single location for all three branches of the armed forces for the first time in the UK, with over 1,100 personnel undergoing training by 800 staff at any one time. Much of the project will involve refurbishment and upgrading of 73,000 sq m of existing buildings on the site and the workforce will include armed forces leavers and injured ex-military personnel as part of an arrangement with the Forces Career Transition Partnership, which helps ex armed forces make the transition to civilian employment, and local organisation Enterprise Works which helps injured services personnel get jobs.